In the heart of Normandy, overlooking the southern bank of the Seine, lies the small medieval town of Honfleur. Its history can be traced back to 1027 in a letter from Richard III, Duke of Normandy. The past has been preserved with the landmarks of its rich history, including a converted garden atop a retired tannery with commissioned art pieces and a hidden logbook for this Geocache of the Week! Le Jardin du Tripot is not just any other garden. The location is serene, with the waters of La Claire routed carefully in stair-stepping troughs on their way to La Morelle. However, the water element serves another purpose: it makes the bronze statues in the courtyard come alive on the hunt for a geocache. 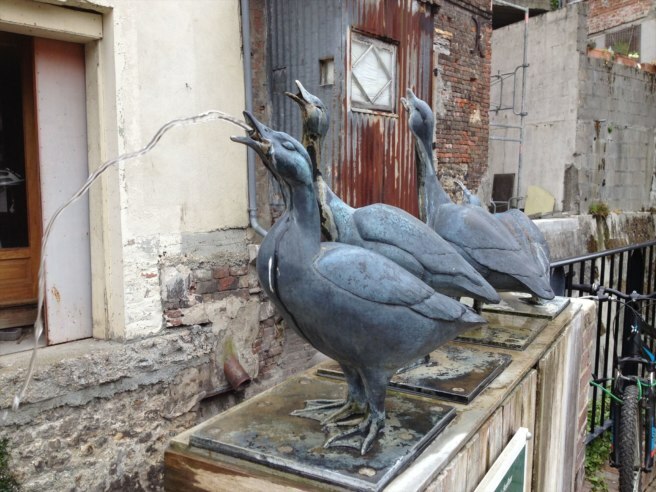 Placed in December 2013, artist Annick Leroy supplied two special sculptures meant to interact with the drainage system of the nearby stream. The first depicts a young boy perched under an umbrella. 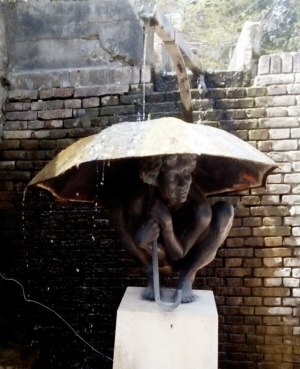 When water is routed to the pipe directly overhead, it gently cascades over the edges of the boy’s cover as he gazes with a dry smile to the opposite side of the garden. Behind his eyes, there is a secret…perhaps it has something to do with the cache hidden close by? If you follow the young boy’s gaze, just beyond the pedestrian streets lined with half-timbered houses, you will easily locate the second converted fountain. Try not to ogle too long at this gaggle! The water is pumped to gracefully exit each beak of the four geese in a steady arc and returned to the river below. They decide to avoid eye contact with any geocacher so as to not give away ground zero. Luckily, the cache does not incorporate an active water feature to retrieve and tries hard to stay dry in its surroundings! Once the cache is located, the finder can appreciate the mosaic fresco nearby, depicting six focused men and women. The scene is in tribute to the hardworking tanners and dyers that inspired the preservation of the vestiges of the old tanneries in the area, one of which is located adjacent to the garden, and an integrated part of Honfleur’s past.